کرباسی بناب, ویدا, یوسفی نژاد عطاری, مهدی, نیشابوری, انسیه. (1396). ارائه مدل دو هدفه مدیریت موجودی با تقاضای فازی برای فروشنده‌های متعدد. تصمیم گیری و تحقیق در عملیات, 2(2), 147-168. ویدا کرباسی بناب; مهدی یوسفی نژاد عطاری; انسیه نیشابوری. "ارائه مدل دو هدفه مدیریت موجودی با تقاضای فازی برای فروشنده‌های متعدد". تصمیم گیری و تحقیق در عملیات, 2, 2, 1396, 147-168. کرباسی بناب, ویدا, یوسفی نژاد عطاری, مهدی, نیشابوری, انسیه. (1396). 'ارائه مدل دو هدفه مدیریت موجودی با تقاضای فازی برای فروشنده‌های متعدد', تصمیم گیری و تحقیق در عملیات, 2(2), pp. 147-168. کرباسی بناب, ویدا, یوسفی نژاد عطاری, مهدی, نیشابوری, انسیه. ارائه مدل دو هدفه مدیریت موجودی با تقاضای فازی برای فروشنده‌های متعدد. تصمیم گیری و تحقیق در عملیات, 1396; 2(2): 147-168. مدیریت موجودی فروشنده، یکی از استراتژی‌های محبوب برای مدیریت سیستم کنترل موجودی می‌باشد که در این استراتژی، فروشنده، مسئولیت کنترل و تکمیل موجودی خرده‌فروشان را بر عهده می‌گیرد. در این مقاله، یک مدل دوهدفه مدیریت موجودی فروشنده با تقاضای فازی برای یک مسئله زنجیره تأمین با ‌فروشندگان و خرده‌فروشان متعدد، موردبررسی قرارگرفته است که تابه‌حال در بررسی‌های انجام‌گرفته در زمینه مدیریت موجودی فروشنده، حالت چند فروشنده در نظر‌ گرفته‌شده است. تقاضای فازی به‌صورت یک عدد فازی ذوزنقه‌ای فرموله شده است و روش غیرفازی‌سازی مرکزی برای غیرفازی کردن توابع خروجی فازی در تمام محاسبات به کار گرفته‌شده است. هر فروشنده، با دو محدودیت تعداد سفارش‌ها و بودجه در دسترس مواجه است و کمینه کردن کل هزینه موجودی و بهینه‌سازی فضای انبار، دو هدف مدل هستند. ازآنجایی‌که مدل پیشنهادی به‌صورت یک مسئله دوهدفه برنامه‌ریزی غیرخطی عدد صحیح فرموله‌شده است، الگوریتم ژنتیک مرتب‌سازی نا مغلوب با توجه به تطابق آن با مدل برای یافتن جواب‌های جبهه پارتو توسعه داده‌شده است. به‌منظور بهبود عملکرد الگوریتم ژنتیک، از روش تاگوچی برای تنظیم پارامتر استفاده‌شده است و مقادیر پارامترهای اندازه جمعیت، تعداد تکرارها، احتمال تقاطع و احتمال جهش تعیین می‌شوند. Vendor managed inventory (VMI) is one of the popular strategies to manage inventory control system, in this strategy, the vendor is responsible for controlling and replenishment the inventory of retailers. In this paper, a bi-objective vendor managed inventory (BOVMI) model with fuzzy demand was investigated for a supply chain problem with multiple vendors and retailers, the fuzzy demand is formulated using trapezoidal fuzzy number (TrFN) where the centroid defuzzification method is employed to defuzzify fuzzy output functions. The vendor confronts two constraints: number of orders and available budget and minimizing the total inventory cost and optimizing the warehouse space are the two objectives of the model. Since the proposed model is formulated ino a bi-objective integer nonlinear programming (INLP) problem, an non-dominated Sorting genetic algorithm-II (NSGA-II) has been developed to find Pareto front solution. To improve the performance of algorithm has been calibrated using Taguchi method. Finally, conclusions are made and future research works are recommended. Cárdenas-Barrón, L. E., Treviño-Garza, G., & Wee, H. M. (2012). A simple and better algorithm to solve the vendor managed inventory control system of multi-product multi-constraint economic order quantity model. Expert systems with applications, 39(3), 3888-3895. Cordeau, J. F., Laganà, D., Musmanno, R., & Vocaturo, F. (2015). A decomposition-based heuristic for the multiple-product inventory-routing problem. Computers & operations research, 55, 153-166. Darwish, M. A., & Odah, O. M. (2010). Vendor managed inventory model for single-vendor multi-retailer supply chains. European journal of operational research, 204(3), 473-484. Gupta, R. K., Bhunia, A. K., & Goyal, S. K. (2009). An application of Genetic Algorithm in solving an inventory model with advance payment and interval valued inventory costs. Mathematical and computer modelling, 49(5-6), 893-905. Magee, J. F. (1958). Production planning and inventory control. McGraw-Hill Book Company. Mirzaei, S., & Seifi, A. (2015). Considering lost sale in inventory routing problems for perishable goods. Computers & industrial engineering, 87, 213-227. Nachiappan, S. P., & Jawahar, N. (2007). A genetic algorithm for optimal operating parameters of VMI system in a two-echelon supply chain. European journal of operational research, 182(3), 1433-1452. Niakan, F., & Rahimi, M. (2015). A multi-objective healthcare inventory routing problem; a fuzzy possibilistic approach. Transportation research part E: Logistics and transportation review, 80, 74-94. Park, Y. B., Yoo, J. S., & Park, H. S. (2016). A genetic algorithm for the vendor-managed inventory routing problem with lost sales. Expert systems with applications, 53, 149-159. Pasandideh, S. H. R., Niaki, S. T. A., & Nia, A. R. (2011). A genetic algorithm for vendor managed inventory control system of multi-product multi-constraint economic order quantity model. Expert systems with applications, 38(3), 2708-2716. Rabbani, M., Rezaei, H., Lashgari, M., & Farrokhi-Asl, H. (2018). Vendor managed inventory control system for deteriorating items using metaheuristic algorithms. Decision science letters, 7(1), 25-38. Rad, R. H., Razmi, J., Sangari, M. S., & Ebrahimi, Z. F. (2014). Optimizing an integrated vendor-managed inventory system for a single-vendor two-buyer supply chain with determining weighting factor for vendor׳ s ordering cost. International journal of production economics, 153, 295-308. Sadeghi, J., & Niaki, S. T. A. (2015). 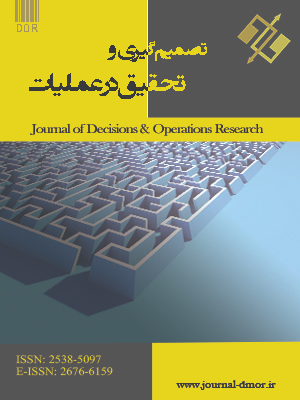 Two parameter tuned multi-objective evolutionary algorithms for a bi-objective vendor managed inventory model with trapezoidal fuzzy demand. Applied soft computing, 30, 567-576. Sadeghi, J., Sadeghi, S., & Niaki, S. T. A. (2014). Optimizing a hybrid vendor-managed inventory and transportation problem with fuzzy demand: an improved particle swarm optimization algorithm. Information sciences, 272, 126-144. T Tersine, R. J. (1994). Principles of inventory and materials management. Prentice Hall. Verma, N. K., & Chatterjee, A. K. (2017). A multiple-retailer replenishment model under VMI: Accounting for the retailer heterogeneity. Computers & industrial engineering, 104, 175-187. Waller, M., Johnson, M. E., & Davis, T. (1999). Vendor-managed inventory in the retail supply chain. Journal of business logistics, 20(1), 183. Yang, W., Chan, F. T., & Kumar, V. (2012). Optimizing replenishment polices using Genetic Algorithm for single-warehouse multi-retailer system. Expert systems with applications, 39(3), 3081-3086. Yao, Y., Evers, P. T., & Dresner, M. E. (2007). Supply chain integration in vendor-managed inventory. Decision support systems, 43(2), 663-674. Yu, Y., Wang, Z., & Liang, L. (2012). A vendor managed inventory supply chain with deteriorating raw materials and products. International journal of production economics, 136(2), 266-274.